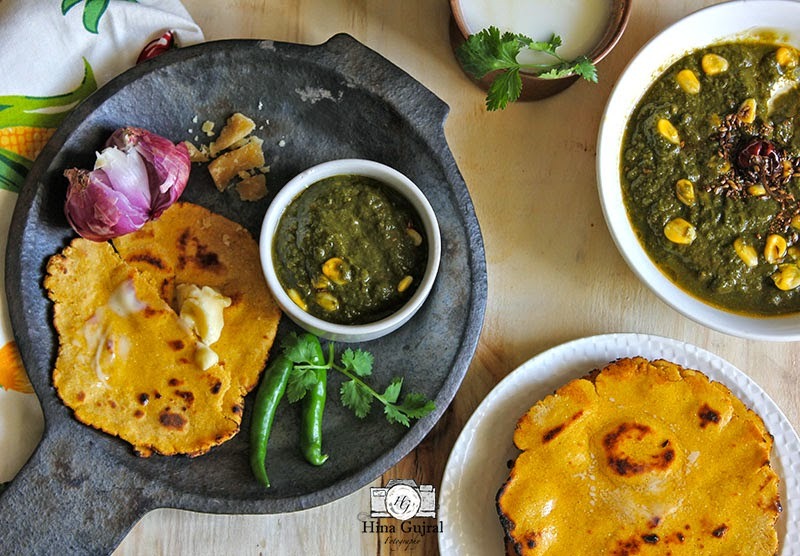 Sarson ka Saag with Makki ki Roti is traditional and staple winter delicacy from the land of five rivers Punjab. The pungent mustard leaves are stewed with other winter greens like spinach, fenugreek, radish, slow cooked for hours over low heat to get hearty and healthy green casserole. During winter the dew enveloped fields are graced with lustrous mustard leaves dotted with yellow flowers of the plant like sunshine in the darkness and then these tender mustard leaves are carefully plucked by the skilful farmers to furnish local vegetable market with the bountiful produce. 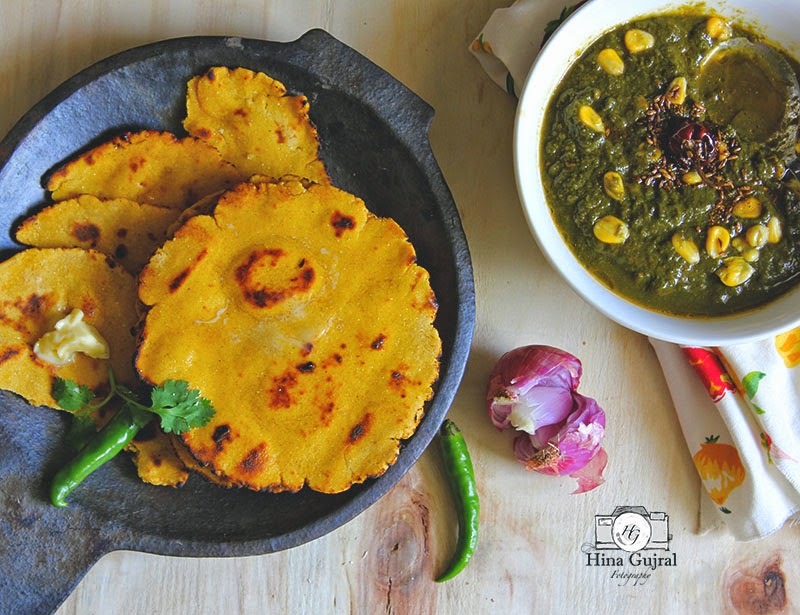 Sarson ka Saag is accompanied by flatbread made of maize flour rustically shaped with delicate fingers into the moon like a round with uneven edges and cooked over stove top to get that earthy taste in the bread. This is the simplest recipe of Sarson ka Saag passed on to me by Sikh mother-in-law which she, in turn, learnt from her mother-in-law. The Sikhs ruled the kingdom of Punjab prosperously till the beginning of British era in India, unfortunately during the partition of India the Punjab province and the Sikh community were divided into equal halves, many left their beloved ones in Pakistan and came to India to start life over again. They travelled across India in search of work opportunities that’s the reason you can find Sikh not only in every corner of the country but all over the world. The community excelled in farming and slowly they cleared malarial swamps, barren land, and dense forests into rich farms hence became the founding fathers of Green Revolution in India, even today Punjab still remains the Granary of India. The Sikh community is also admired for their lifestyle, food, and culture, from the early days only Sikhs are known as great eaters, the Sikh cuisine is a mixed bag of robust vegetable curries, healthy mixed lentil stews, fatty meat curries, whole grain flatbreads laden with homemade ghee and all washed down with gallons of freshly churned buttermilk. 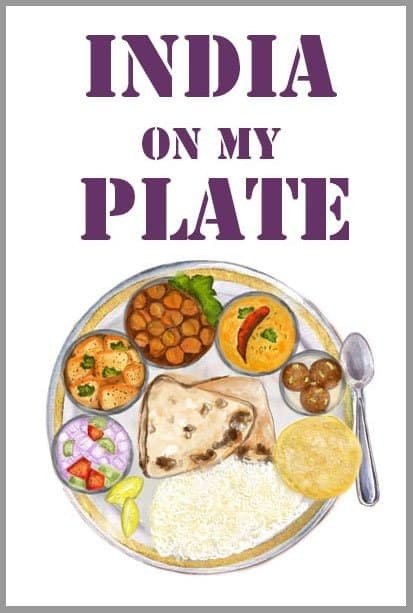 This kind of wholesome and nourishing diet was designed for energetic, diligent farmers and warriors with well-built physique and stamina who worked hard day and night but slowly this became the food culture of the whole community religiously followed in every Sikh household including mine. Winters are welcomed in a Sikh household with bottles full of deep brown jaggery chunks making it to the kitchen shelves, family gatherings during the evening around the bonfire are accompanied by an uninterrupted supply of groundnut, masala chai and chikki (sweet made of dry fruits, groundnut, and jaggery). The dinner table is embellished with mutton curry, unpretentious dal capped with blobs of homemade white butter (see recipe here) and then there would be Sarson Ka Saag the centerpiece of the dinner table,the sweet-smelling aroma of the Saag engulfs the air around teasing one’s appetite and there comes continuous supply of piping hot Makki ki Roti smeared with ghee from the kitchen to sop up the Saag. The whole experience of enjoying this home cooked a scrumptious meal is one of that soul-satisfying experience for a food lover. And before you retire to bed the last conversations of the day are done with a steaming glassful of Khus Khus and Almond Milk (recipe coming soon on the blog). 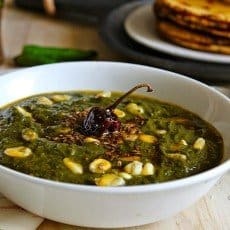 Sarson ka Saag is pungent mustard leaves stew, slow cooked for hours over low heat to get hearty and healthy green casserole. To make saag first, clean, wash and chop all the greens (mustard, spinach and other). Once chopped soak them in water for 15 – 20 minutes to get rid of dirt particles. Drain greens in a colander and set aside until required. Heat ghee in a cooking vessel over medium heat and saute chopped onion, ginger, garlic and green chilies over medium heat for 10 minutes or until onion turn light brown in color. Now add chopped tomato along with salt and red chili. Saute for 5 minutes over medium heat. Once tomato is sauteed add chopped greens and stir nicely.Saute till greens turn soft in texture. Add 4 Cups of water and let saag simmer over low heat till water is reduced to half and greens are completely cooked. Grind the saag in blender either to smooth puree or to coarse consistency, whichever way you prefer. 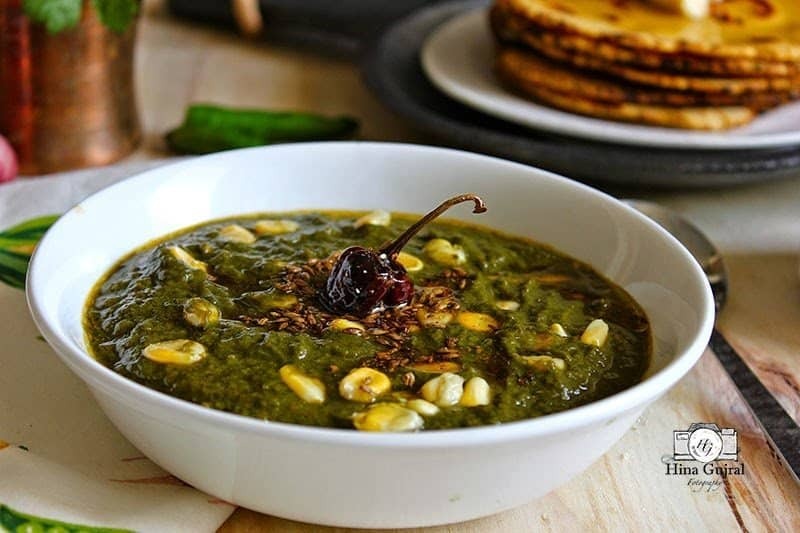 If you are adding corn kernels then saute them in a pan with 1 tbsp of oil and add to the pureed saag. If not, then simply skip this step. Transfer saag into a saucepan and turn on the heat. Let it simmer over low heat while you prepare tempering. For tempering, heat ghee in a small pan add cumin and once it starts crackling add dry red chilies. Pour tempering over the saag and mix nicely. Cook saag for 10 minutes more and then turn off the heat. 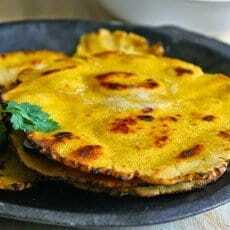 Serve hot with Makki Ki Roti with more ghee on top. To prepare dough, sift flours and salt together in a bowl. Add oil and gently rub the flour in between fingers to get crumble like texture. Using little lukewarm water at a time bind smooth and firm dough. Knead for 5 minutes and then shape into a round ball. Transfer dough to a clean dry bowl covered with a kitchen towel. Let dough rest for 15 minutes. To make roti, heat iron skillet (tawa) over medium heat. Line kitchen counter surface with a clean dry plastic sheet. Grease it with 1 tsp of oil. Pinch a portion of dough and roll into a ball and then flatten the dough ball using fingers. Place the flatten dough ball over the plastic sheet and with a rolling pin roll out to medium size roti of approximately 3 inch diameter. Makki ki Roti is little thick so make sure not to roll it out too thin like regular chapati. Now slowly transfer the roti from plastic sheet to your palm. Greasing plastic sheet beforehand makes this step easier. 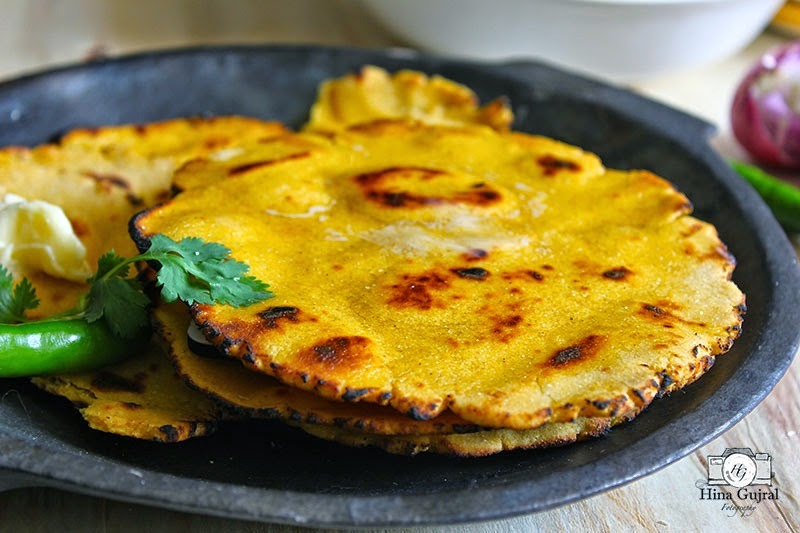 Place the roti from your palm to heated skillet and cook on both sides. Do not flip roti more than once or twice as it is bit fragile. Cook roti direct heat like Chapati over medium flame, flipping in between to cook evenly from both sides. 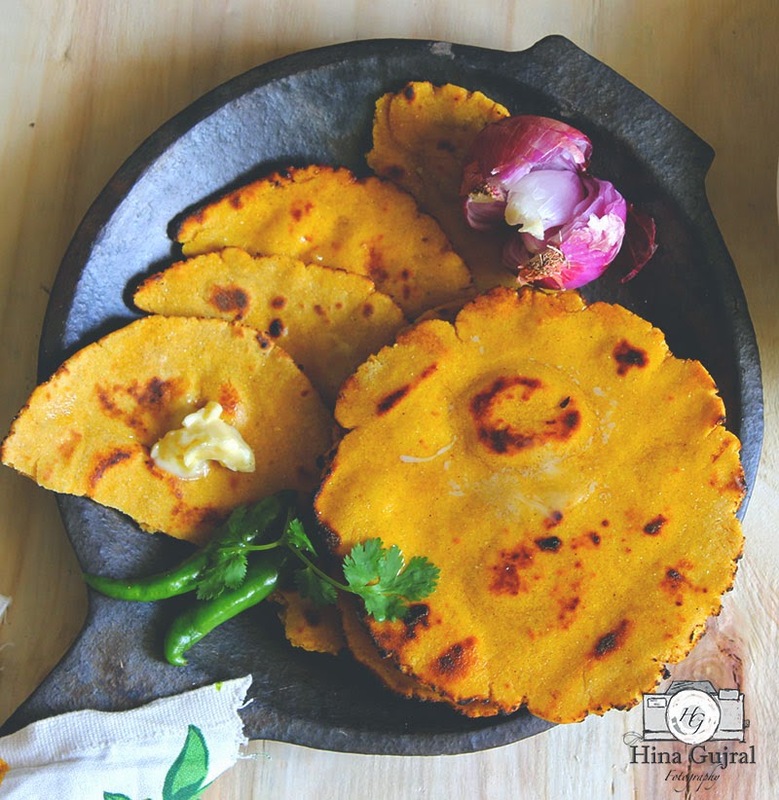 Brown spots or charred marks will appear once roti is cooked. Transfer to plate and and smear either white butter or ghee. 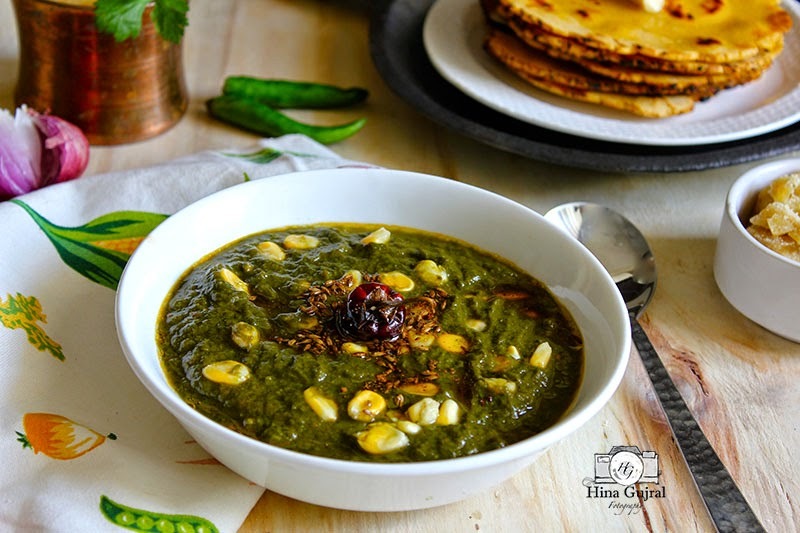 Serve hot with Sarson ka Saag. I am so glad the purpose of this blog is solved …to make things easy ….try this out and reach me in case of any doubt. Love your blog. Do yo think maybe a list of spices and reliable sources for purchase would help. I.promise to retreat to help you grow. A new fan who loves what you are doing.